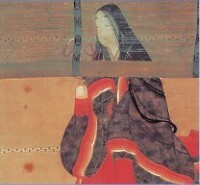 As soon as I was in her [Majesty’s] presence I realized that she had called me to discuss what I had written to Tadanobu. ‘The Emperor has been here,’ she said, ‘and he told me that all his gentlemen have your reply written on their fans.’ I was amazed and wondered who could have spread the news. The exchange of poem letters were quite as public and almost as quickly distributed within the limited world of the court, as tweets and other online social updates are today. And as this example shows, they even had the capacity to ‘go viral’.